I did this a while back, but just have been slack on the blog. I am officially in love with SOLO, and in particular SOLO hexagons. I am going to have to treat myself to some of Pam Hooks books, and think carefully about how I can more fully and usefully integrate SOLO into my teaching and learning. 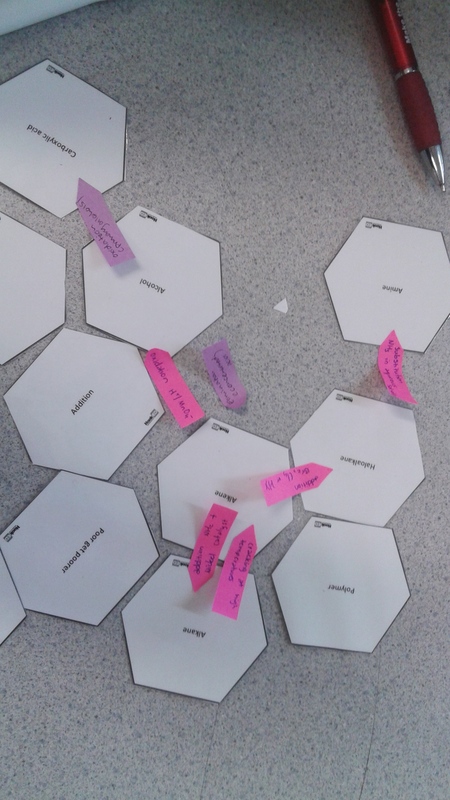 But this activity worked a treat – various Organic families and reagents listed on SOLO hexagons, using post it notes to add in any special reaction conditions. It worked really well, and allowed me to get a really good idea of what they knew and what they were still unsure of. I am hoping that as the students use these more they will start to have more discussions amongst themselves rather than just with me as I ask them questions. But we are still trying to break the shackles of the teacher at the front of the room, so baby steps and we will keep at it.